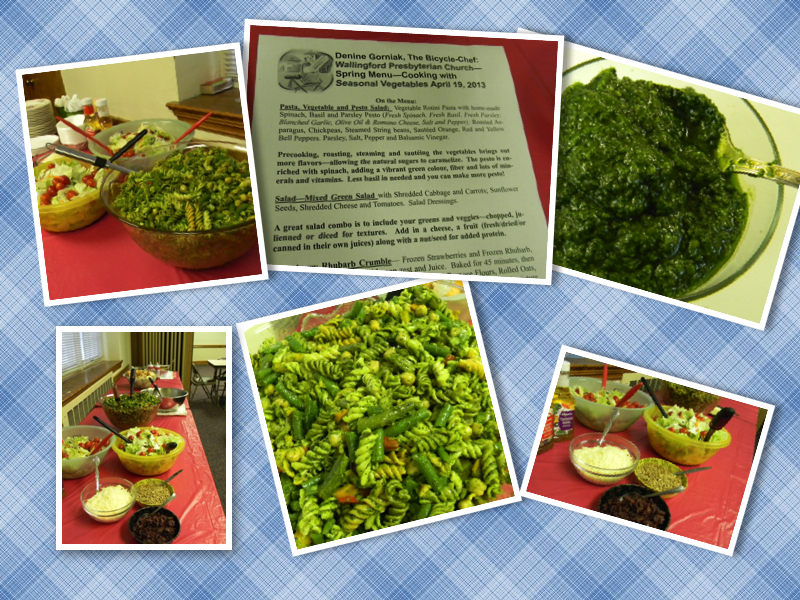 I had the opportunity to do a cooking event at my church out in Wallingford, PA. It was Friday night, April 19th. 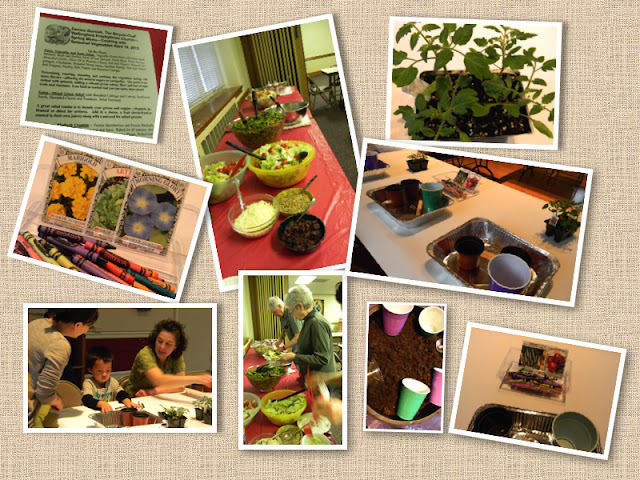 The church does a monthly event for kids and their parents, ice cream socials, cooking classes, art projects. This month's event was a garden and cooking event. We had the kids and their parents plant tomato plants and flowers. Everyone got to take their plants home for their gardens. I was asked to cook a dinner and dessert using seasonal vegetables. I cooked a meal, gave a little talk about what's in season and how to use the vegetables and then we ate dinner and had dessert. Naturally, I cooked enough food to feed, oh, I don't know, about 40 people! I think we had 15 people, maybe 20 at most. There were left overs for days on end. Now, in my defense, I do cook a lot and often make way more than any event needs, but...I was told to expect at least 35 people. I shopped, prepped, cooked and schlepped food for two days! Ugh! It was for a good cause. And the folks in attendance did enjoy what I made. And even though I missed Liz's opera opening night of Magic Flute (my first opening night in 9 years that I've missed), I was doing God's work. 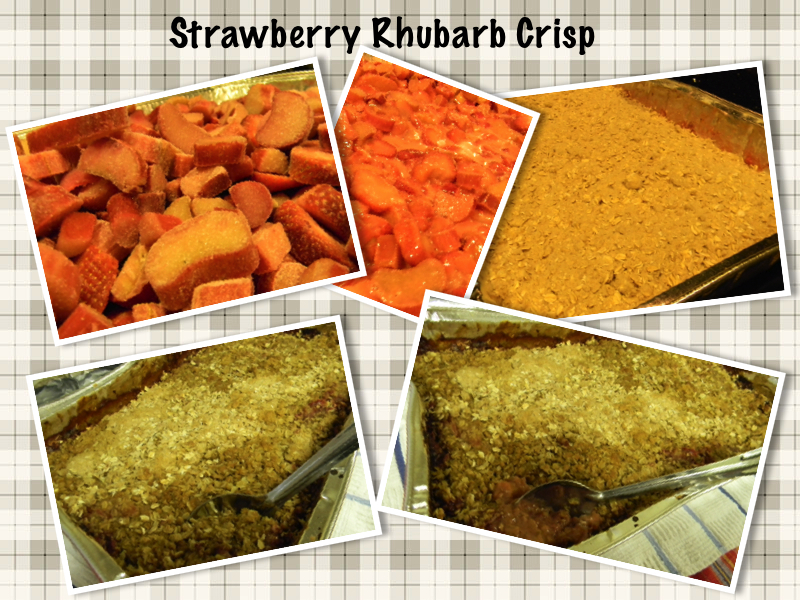 On the menu was a vegetable pasta salad with homemade spinach and basil pesto; fresh salad with sunflower seeds, craisins and cheese; rolls and butter; and for dessert, strawberry rhubarb crisp. I used as many in-season vegetables as I could, utilizing what's fresh, local and available now. While I tend to cook as light and fresh as possible for my eating, I realized that I was feeding people I didn't know - going too light and fresh might not taste as good to other people as it does to me. Therefore, I worked within different but still healthy parameters. My tips for making pasta salad healthier are: Swap out white pasta for whole wheat, high fiber or pasta with a serving of vegetables in it; Use light cheese instead of full-fat. Add in more veggies, but cook them - roast, sauté, grill or steam them to bring out their natural sugars and sweetness; when making pesto - add in spinach to stretch it, make it greener, amp up the vegetable quota; skip nuts; blanch or roast the garlic to tame it; use less cheese, or add it as you need it, instead of when you're making the pesto. The pesto will keep longer and stay fresher. For my pasta salad - I grilled the asparagus, sautéed the peppers, and steamed the green beans. Everything tasted a bit sweeter. The pasta salad worked great cold and could be heated up as well. I used a combination of whole wheat pasta and vegetable pastas. I'm posting my recipe for Spinach Pesto. It's fairly similar to my basil oil - though I don't separate the oil from the herbs, nor do I use as much basil and oil, but the idea is similar - just oil & the leaves - leaving out the unnecessary stuff until you really need it. Blanch the garlic in hot boiling water, boiling the garlic for 2 to 3 minutes. Run under cold water to cool before adding to the pesto ingredients. Add the spinach, basil and parsley, and blanched and cooled garlic into the work bowl of a food processor fitted with the blade attachment or into a blender. Pulse a few times to get the leaves to start forming a paste. Keep the the lid on the blender or food processor and the machine running, drizzle in the olive oil in a slow stream through the pin-hole or removable lid of the blender or food processor. The mixture should form a paste. If need be, turn off the machine, and scrape down the sides of the work bowl. Replace lid and turn the machine back on and continue adding in the oil. The mixture should be thick, not runny, but should also be a bit loose. Scrap out the pesto into a bowl, then season to taste with salt and freshly ground black pepper. When ready to use, stir in the finely grated cheese. Adding it as you need it will help the pesto keep fresh longer. Store the pesto tightly covered and refrigerated. Pesto without the cheese added to it can be frozen for up to 3 months. This pesto will keep, refrigerated, for up to 1 week. Adding the spinach to it will help maintain its intense green colour. Makes 1 cup. Add more of each, spinach, basil, parsley, oil, as needed. My recipes, as usual, are a casual affair. I usually toss in ingredients until I think they are where I want them to be! I'll have to try adding spinach to my pesto recipe. Makes sense! Thanks! the spinach to the pesto is an old idea "borrowed" from my cooking days at The Reading Terminal. It came out of being cheap! We needed to make lots of pesto, so this helped and it kept the pesto BRIGHT Green. I also add vinegar to the pasta salad to really get it going - eliminates the need for more salt and oil. I thought the addition of some parsley would cut through the two too tanninicky tastes of the basil & spinach!